In a large caldero brown the chicken parts in the oil, 5 minutes each side. Remove chicken from the pot and set aside. Don't put them on paper towels - we want any grease back in the pot. 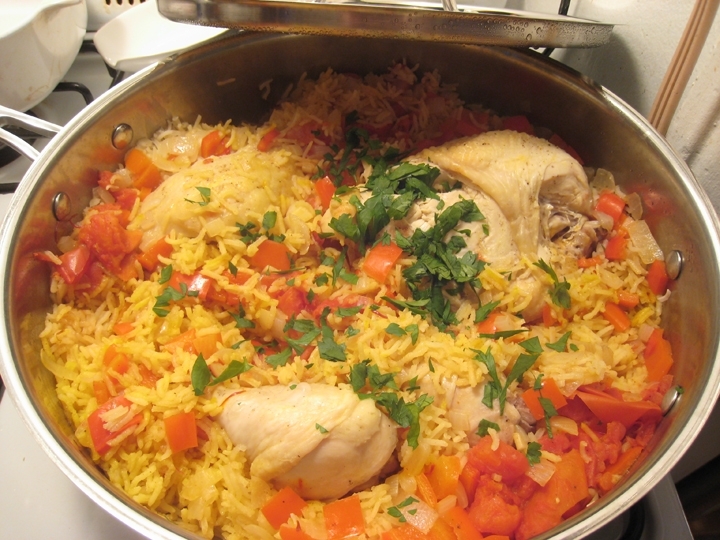 Leave the chicken drippings inside the pot and add all the other ingredients except for the rice, water and chicken. Mix well and cook sofrito for 5 minutes over medium heat. Add the chicken and rice to the pot and stir. Add the boiling water until the water is about 1 inch above the rice, stir once only. Boil uncovered, over high heat, until water is absorbed. Once the water is absorbed gently stir from bottom to top. Just a couple of turns only. Cover and continue to cook over LOW heat for another 30 minutes or until the rice is tender. Don't concern yourself with weighing the meat too much. If you are serving 5 people just use 5 - 8 pieces of meat. Resist the temptation to stir. Too much stirring causes the rice to become "amogollao" or sticky. It is traditional to cook the chicken with bones and all. People will just pull the meat off the bones with their fork. If you have cilantro add some to the top of the pot once it is done, for decoration. Don't let your rice get "ahumado" or smoked from cooking at too high temperature. For great pegao just cook a bit longer keeping an eye on it. For a lot of peagao use a larger caldero (it will just be half empty). Adding liquid in olive jar will make it too salty.